Do You Ever Get The Feeling That You Got Something For Free? Even though I had spent hours on each photo and put a lot of thought into every processing decision, this was the feeling I got when I started experimenting with textures on my ‘old’ ICM images, what was to become my “Visions” project. This was of course an illusion, after all I – as always – had but a lot of thought and effort into the original processing. Nevertheless, it was a good feeling that gave me energy when I chose the perfect texture and blend mode for my favourite images that I thought had potential for new life with the help of further processing by adding one or several texture layers. When working on this project, my goal isn’t to improve the original, it’s all about trying to create a completely new image without losing the quality of the original image, the reason why I find it appealing. For example, I don’t use a texture that would make a subtle peaceful scene dramatic. The ideal texture creates an image that keeps the original quality and adds something new, preferably a subtle painterly effect that borders to abstract. It should not immediately be clear what you are seeing, I want to give the viewer a chance to interpret the scene and perhaps -after a while- find a hidden element or dimension. All original photos are single ICM exposure, I always shoot RAW. Processing in Lightroom and Photoshop CC. I find the processing profiles in ACR to be a valuable creative tool and always end up using a profile from the ‘Artistic’ or ‘Vintage’ set, applied in Lightroom. Since I find working with layers the best way of processing, I do the main processing in Photoshop. The ability to, by toggling layers on and off, is invaluable when deciding if an adjustment is working or not. And of course, the ability to fine tune by experimenting with the opacity. In Photoshop there’s and extension designed to work with textures, from the menu you can go to Window > Extensions and select “Adobe Paper Texture Pro”. This will bring up the panel you see in the screenshot below. Since the purpose with this post is to describe my workflow I will not get in to the details about the above mentioned extension. 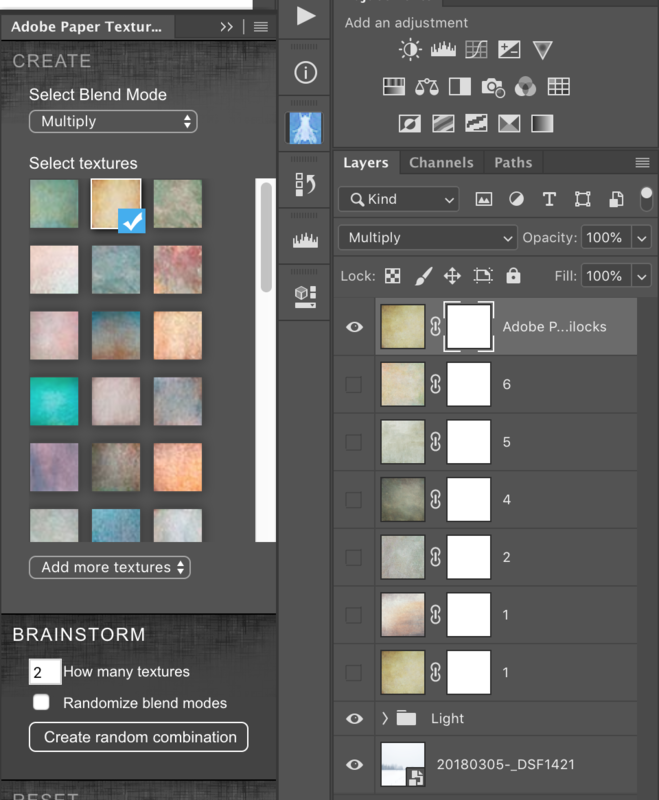 The first thing you do -with the top layer in your layer stack selected – is set a blend mode in the texture panel and click on one of the textures. This will add the texture to the top of your layer stack, you now have an image with a texture. Blend modes that tend to work is ‘Multiply’, ‘Overlay’ or ‘Soft Light’. It doesn’t matter which blend mode you set at this stage, the goal is to figure out which one that works for the image in question. To do this, try different blend modes in the layers panel with a couple of different textures. You will quickly see which blend mode has potential, when you do, set that blend mode in the texture panel. Now to my workflow….it’s not rocket science but I think it works well. It’s all about going through all your textures in a methodical way. This is how I do it. In the texture panel, start from the top and work your way down. When you click on a texture it gets added as a layer and the thumbnail gets a check mark. If you think the texture has potential, disable the visibility of the layer and try the next texture by selecting it from the texture panel. If you do not think it has potential, deselect it in the texture panel and the layer will be deleted. Repeat until you have tried all your textures, it can often be worth the time even if you think you already have a winner. Your layer stack should now -hopefully- have a number of textures with potential and look something like the screenshot to the right. Sometimes I have just a few, most of the time ten or more. It is now time to decide which texture or textures that creates the most compelling image. To do this turn on the layer visibility one layer at the time, if you no longer think it has potential, delete the layer in the layers panel. If you still think it has potential, turn off the visibility and try the next texture. When you are down to a manageable number of potential textures, the best way to come to a decision is to toggle the different layers on and off in a fairly rapid pace. Why ? It’s the best way to evaluate the options, your mind is able to compare them, almost as they were side by side on the screen. When you are down to a couple of options, say two to three, it’s time to slow down and carefully compare and evaluate by repeatedly studying the differences between your options. There are of course few -if any- rules on how to come to a decision but I have some guidelines I find useful that applies to all processing. Stay away from -what I refer to as- “Wow adjustments”. What is that? It’s any adjustment you make that makes you go “WOW !”. Why? In my experience, this reaction is proof that you have gone too far and the adjustment you’ve made will get old extremely fast and before you know it you will go “-What was I thinking?” The remedy? Every time you go “Wow”, dial the opacity way down, I’m talking to 10-20%. Try and understand what you like and don’t like about your photos, get to know yourself. If you know that you like subtle serene scenes, you will not opt for a texture that goes against that. If you know that you don’t like pure abstract images, you will not opt for a texture that turns your image into an abstraction. If you can’t come to a decision , save your file, step away and come back with fresh eyes. Don’t force it. Thank you for your time, if you found this useful, please let me know and share with your friends. Don’t forget to visit my Visions portfolio. Thank you for the extensive write up, Anders. Most welcome, thank you for your comment! Thank you for this Anders. I have so far done all of my post-processing in Lightroom but will be looking at trying your Photoshop methods as a new processing choice for my ICM images. Most welcome, very pleased that you found it useful, thank you for your feedback. Let me know how it goes with Photoshop, feel free to contact me if you have any questions. Maybe I should write a few words about my general workflow….not sure the world needs it though, there must be millions of posts on the subject ?